New Website for Community Animal Hospital Now LIVE! Posted by Blue on Aug 2, 2014 in News | Comments Off on New Website for Community Animal Hospital Now LIVE! Home » News » New Website for Community Animal Hospital Now LIVE! 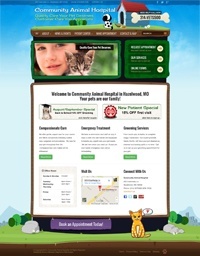 I am thrilled to announce our latest new website for Community Animal Hospital in Hazelwood, Missouri. I absolutely adore this whimsical Wordpress template that I’ve customized with fun animations and illustrations. Website visitors will enjoy exploring this website!